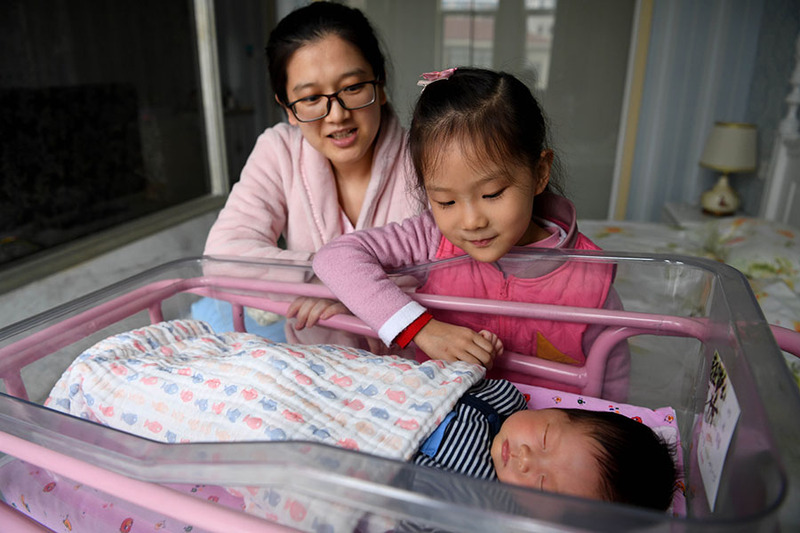 Births in China are forecast to decrease further in the years ahead, as is the number of workers, a top official with the National Bureau of Statistics said. The projection was made by Li Xiru, head of the population and employment statistics department of the NBS in an article published on the bureau's website on Wednesday. The estimate was published two days after official figures on last year's population showed a steep decline of 2 million births and fueled concerns about a future labor shortage and its potential negative impact on economic growth. "Based on the current number and demographics of fertile women, as well as the fertility rate, China's annual newborn population is projected to continue its decline in the coming years. But total births are set to outnumber total deaths, thus leading to moderate population growth," Li said. Last year, 15.23 million babies were born on the Chinese mainland, compared with 17.23 million in 2017 and 17.86 million in 2016, according to the NBS. Li said the birth decline is the result of a shrinking population of women of childbearing age and the easing effect of the second child policy, which was implemented in early 2016 to allow all couples to have two children. The NBS data shows that fertile women aged 15 to 49 dropped by 7 million year-on-year in 2018, and the number of women at peak fertility, age 20 to 29, was down by 5 million. "However, China is still home to a massive population of women at peak fertility, currently around 100 million, despite the recent fall," Li said, which he believed would help the total population remain on a steady upward trend. In an earlier report released by the population and labor economics research branch of the Chinese Academy of Social Sciences, researchers predicted that an inevitable dip in total population is likely to occur as early as 2027. They urge immediate research and policymaking to tackle the coming population shift. Accompanying the birth decline is a swelling number of elderly and a shrinking working-age population. "The number and proportion of those aged 16 to 59 have been falling for seven consecutive years," he said. "And the number of people employed saw its first decrease last year. "But the number of people of working age still stands at almost 900 million, and around 780 million are employed." The figures, according to Li, suggest there's an abundant supply of domestic labor. "By improving the labor force participation rate, expanding educational avenues and employment opportunities, we can fully make use of the potential of the workforce," he said. Li added that the increasing proportion of people over 60 would pile pressure on those of working age and pose challenges to economic development and social insurance policies.